So where in the world is Jeem these days? Apparently people are asking. Since the end of August I have been seconded by my employer, Kwantlen Polytechnic University, and my union, Local 704 of the BCGEU, to the workplace campaign of the United Way of the Lower Mainland. I am one of a number of loaned representatives to the United Way, from a variety of organisations, like HSBC, UBC, Canadian Border Services, the City of Burnaby, and others, including KPU. My employer generously loans two people to the campaign for four months: one from faculty, and one from staff (that being me). In both instances, our respective unions are involved in the process. Because KPU pays us, the United Way gets the benefit of our work, at no cost, hence keeping their overall expenses down. In fact, among charities in Canada, the United Way has some of the lowest overhead costs, partly due to the loaned rep program. And what in the world is Jeem doing these days? 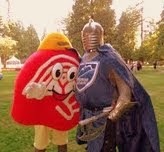 Well, I call on a variety of "clients" and assist them with their workplace campaigns to raise money for the United Way. I have eleven accounts and most are with the Government of Canada: Canadian Food Inspection Agency, Transport Canada, Statistics Canada, the Office of the Auditor General for Canada, etc. I have one agency outside the government, that being the City of North Vancouver, and I assist other loaned reps with their work at various locations throughout Metro Vancouver. I work out of the United Way building in Burnaby, just across from BCIT on Canada Way. My work space is in an area called "the hive" and at times it buzzes with activity. At other times, many of us are out, calling on various work sites, and the hive is quiet. 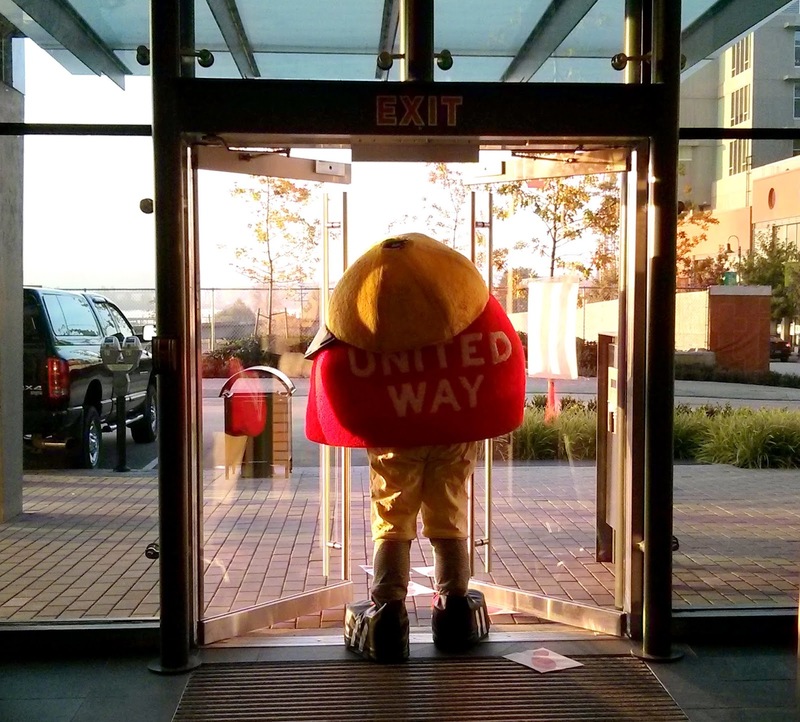 On several occasions I have become Care-y, the mascot of the United Way. Care-y is a strange sort of costumed character and has been known to make some children laugh and others cry. It isn't easy being Care-y. 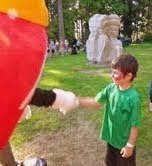 I was Care-y for a City of Coquitlam event when the air temp was 28 degrees. Inside the costume it felt about 40 degrees. This was not a pleasant experience for Jeem. I have difficulty wearing my glasses while inside Care-y, though that wouldn't help much as my eyes don't really line up with the "eye holes". Still, I get to meet other super heroes ... I get to shake hands with great kids, and ... I get to make automatic doors stay open ... all the time. It's one of the perks of being the mascot. The United Way makes a world of difference throughout our region. Check out the website and take just a few moments to view our new video. We can make a difference. Change can happen.